As the article says, it’s a bit depressing as survey… Especially when we know that computer speakers are generally of very poor quality. As yet today, even with a very limited budget, you can afford a 2.1 system of very good quality for a bit less than 50$. 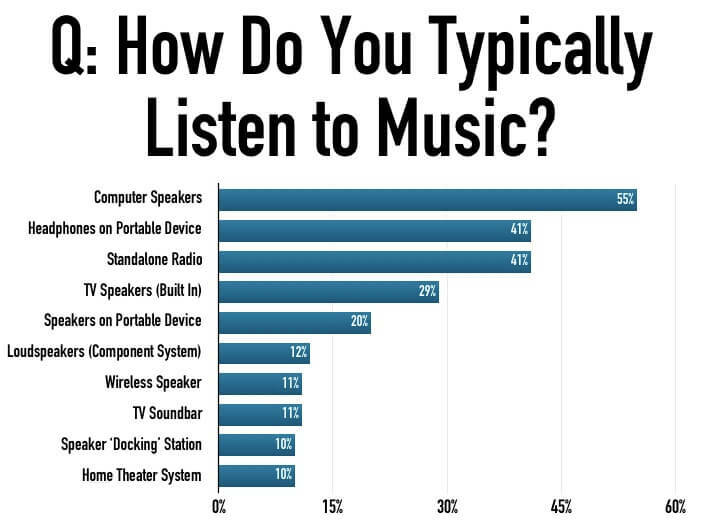 According to a survey conducted by Strategy Analytics, built-in computer speakers are now the most common way to listen to music, by a sizable margin. In the study, laptop and desktop speakers overwhelmingly topped the list of frequently-used listening methods, with 55% picking the category. Headphones connected to a portable device followed with 41% of respondents, alongside stand-alone radio, also with 41%. Surprisingly, TV speakers were also highly-ranked, with 29% ticking that box.